Yesterday's Empire Manufacturing index was a booming 25.6 and today's NAHB Housing Market Index was a solid 53. In addition, Chinese officials announced an uptick in second-quarter GDP, and the UK enjoyed a strong employment data overnight. These, along with solid earnings reports, are keeping optimism pumping through the veins of the market. The general rule of thumb is that markets move higher into and during earnings, but sometimes slip up as the reporting season comes to a close. Will that be the case this quarter? This is a REALLY tough market. Both stocks and bonds are too high to buy, but selling certainly hasn't worked. We are sorry the commentary in this section has become so repetitive and boring, but we can't make the market move and we don't see any reason to over think things (or waste your time). Bonds and notes have been trading sideways for what feels like "forever". We have been of the opinion, and continue to believe, that the risk is to the upside. In other words, if the trading range is eventually breached, it will most likely be on break-out rally. Thus, any dips to support (134ish) are good places for the bulls to dig in, but any trip to resistance (138ish), is a good place to protect profits (if you have them). According to the latest COT Report, data collected by the CFTC depicts a scenario in which both large and small speculators ("smart" and "dumb" money) are adding to short positions. This could mean one of two things; either they are right and will soon be basking in profits, or they are wrong and are destined to be victims of a painful short squeeze. Thus far in 2014, the latter has been the most likely outcome. We suspect it will continue to be. **Consensus:** 138 resistance held, we are short-term neutral and looking for the next clue. 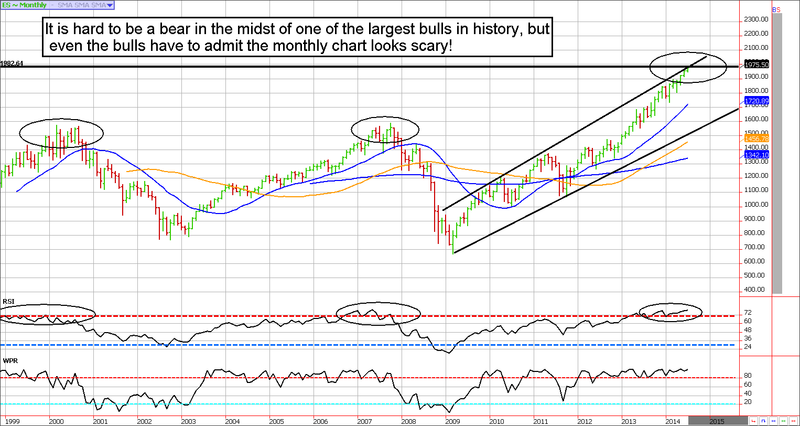 The truth is, we pointed out the eerie setup on the monthly S&P chart a few months ago. Since then very little has changed; other than, of course, the S&P has climbed steadily higher. The market continues to hug the up-trend trading channel resistance and technical oscillators remain alarmingly overbought. In fact, the Williams %R on a monthly chart is currently reading 99.53 (the max is 100 and I've never actually seen it)!! Generally, anything over 80 is considered to be overheated. A reading of 99.50 is sparsely seen, and rarely survived in the long run (although it can be sustained for months before the market succumbs to the pressure of a correction). Similarly, this is only the third time since 1999 a monthly chart of the ES has produced an RSI (Relative Strength Index) in excess of 70. We are currently at 78ish. In the previous two occasions, the market underwent dramatic corrections. Will this time be different? We've been wrong, but we refuse to be bulls "up here" based on the big picture. Nonetheless, the daily chart is likely seeking a test of 1983, or even 1996ish. Perhaps, there is a chance these resistance areas will give the bears a break and get the ball rolling in the opposite direction. **Consensus:** The market traded decisively over 1970, and is likely headed for 1983ish, or maybe even 1996. There should be technical resistance there. May 28 - Sell July ES 1950 calls for about $9.00. May 29 - Sell August 30-year bond 142 calls near 30 ticks. 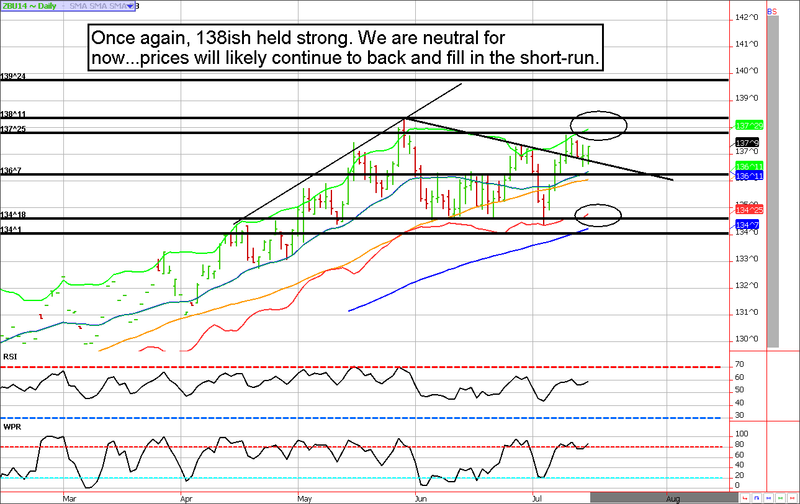 June 3 - Buy June VIX near 13.30. June 9 - Roll July ES 1950 calls into August 1970 calls for even money. June 12 - Roll June VIX into the July futures contract. July 2 - Roll August 1970 calls into 2 August 1995 calls. July 3 - Roll July 1970 into September 2010 calls. July 14 - Roll July VIX into August (we are giving this one more shot).